Your ancestors put some pretty gnarly things in their mouths. People in different places at different times have eaten what they had to in order to stay alive. People in some places eat sea cucumbers. You’ve probably put some pretty gnarly things in your own mouth when you think about it. The same people who wince at the idea of eating an oyster will happily shove the leg of a chicken in their mouth; those who gag at the thought of eating a fried grasshopper will eagerly gobble down a fried shrimp, which is basically the grasshopper of the sea. I guess it’s all about what you’re used to. Today I want to tell you about bottarga. A specialty of southern Italy, bottarga is the dried, salted roe sacks of either mullet — bottarga di muggine — or tuna — bottarga di tonna. I decided to write about it this morning, as I was in the kitchen with a very sharp knife shaving the the mold off the outside to have some for lunch when our nanny, Karina, said, “What’s THAT?! ?” And I explained to her what it was and what you do with it. As you can see from the picture, it’s appeal is not immediately clear. Somewhat like an unsliced salami — a good analogy for this particular piece, which has molded over. But the mold merely keeps the treasure inside safe. Like most dried, salted things, bottarga originally evolved in the days before refrigeration as a method to preserve the edible egg sacks of these fish for future use. (It seems to me that many of the world’s best foods evolved in the days before refrigeration.) For eons it toiled in the obscurity of rustic regionality, before finding its way onto the menus of upscale Italian eateries from New York to Beverly Hills. I wish I had known it in the olden days, when it was probably pennies a pound. Now it is an expensive delicacy. But a little goes a long way. 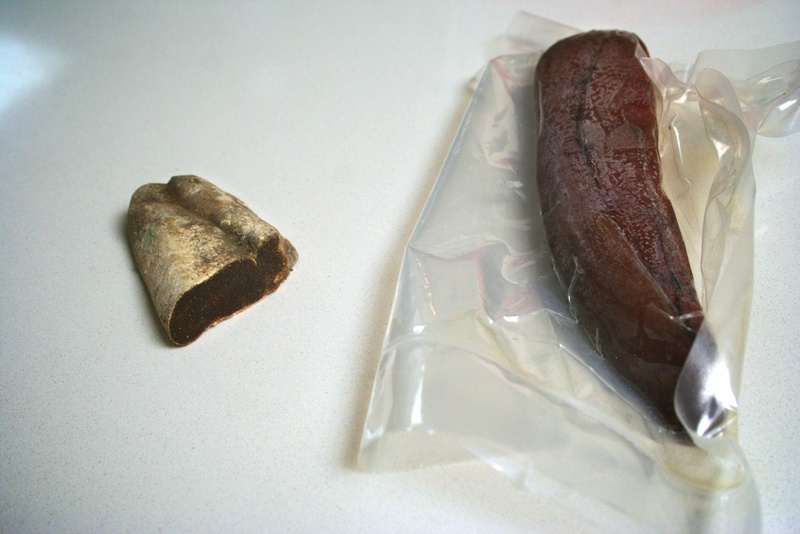 Now what on earth, you reasonably ask, does one do with dried mullet roe? Here’s a lusty summer recipe that will transport you to a seaside village on Sardinia as the sun sets. Make sure you’ve got a big red wine to drink with it. And if you can’t find bottarga or don’t have the will to try it, the recipe will still work with parmesan sprinkled instead. In a large saucepan, cook the tomatoes in the olive oil until most of the moisture is gone and the tomatoes are thick and saucy. Season liberally with salt. Cook the pasta in salted water until al dente. With tongs, lift the pasta out of the water and into the sauce pan, allowing some of the pasta water to come along for the ride. Turn the sauce to high heat, toss pasta until completely coated. If the sauce has become at all watery, continue to cook over high heat. Then turn off when thickened. With the tongs, divide the pasta into piles on two large plates. Scoop any extra sauce over the pasta. Sprinkle with pepperoncini, then with a cheese grater, shave the bottarga evenly over the two plates. Serve with salt and pepper to each diner’s preference, and a bottle of good red wine.